People across the nation have been pointing fingers at the Union Government for its failure in curtailing the alarming rise of fuel prices. Instead of accepting its failure, The National Party tried to defend itself with improper graphical representation. 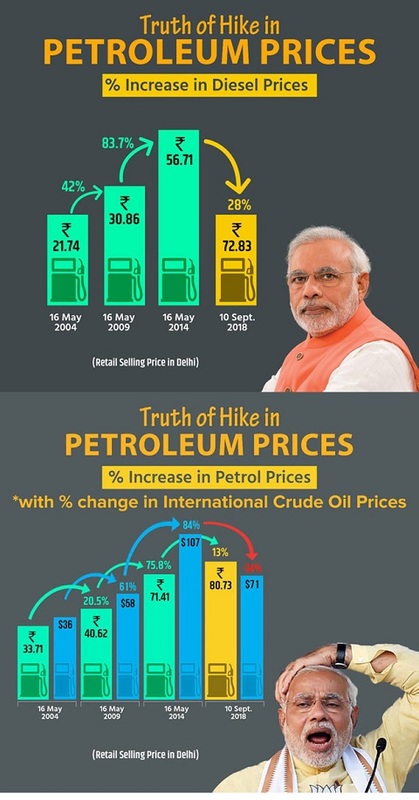 On the official Twitter handle of BJP, A graphical representation showing the difference in fuel prices during UPA tenure and NDA regime have shown. While the diesel prices have increased drastically in the recent years, BJP projected as if it’s far better than what it used to be during UPA tenure. Netizens didn’t take much time to notice the unacceptable activity of BJP. Else, People’s Mandate in 2019 Lok Sabha could be shocking to say the least.